The Hailuogou Glacier has retreated 1.8 km during the 20th century. 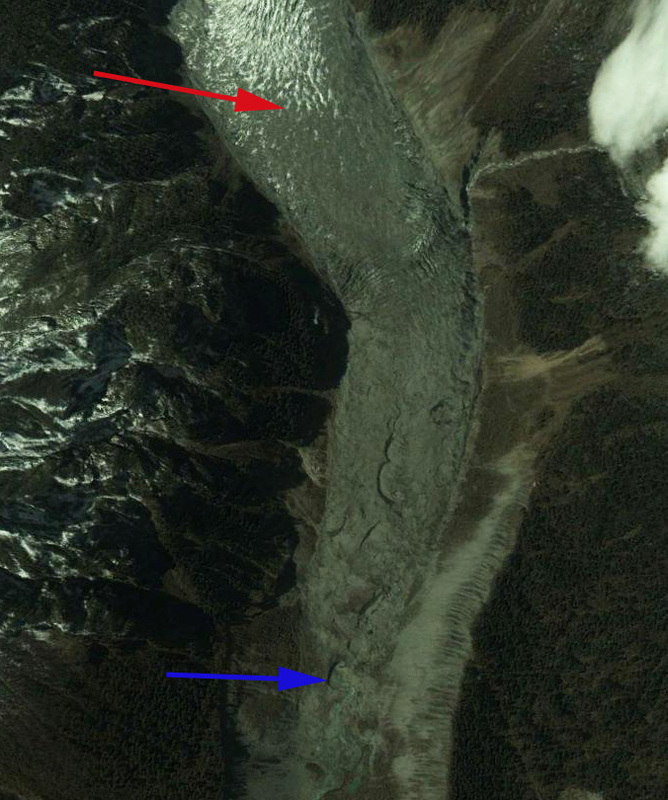 This glacier drains southeast from Gongga Shan beginning at 7500 m and extending to a debris covered terminus at 3000 m. The first image is a map from Li et al (2010). The glacier has been the focus of an ongoing research program by the Laboratory of Cryospheric Sciences, Chinese Academy of Sciences, Lanzhou, China and Nagoya University, Japan. This glacier is a summer accumulation type glacier fed largely by the summer monsoon. The glacier feeds the Dadu River. which eventually joins the Yangtze River. 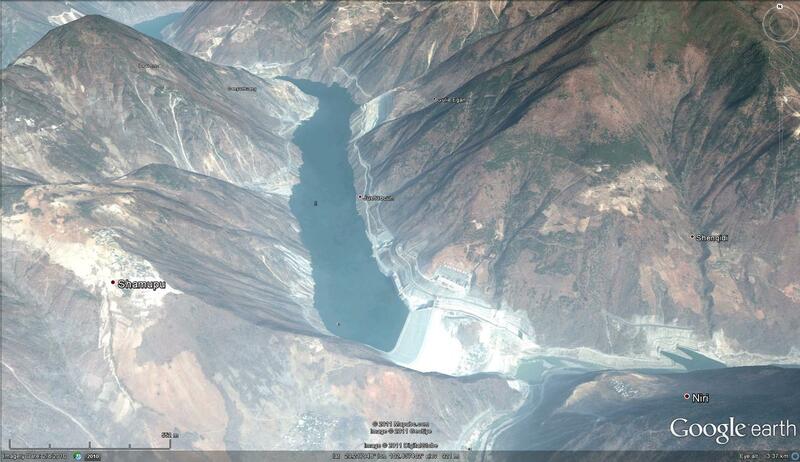 The Dadu River has a series of hydropower plants that fed in part by the glaciers of Gongga Shan. The Pubugou Hydropower Station has a total generating capacity is 3,300 MW, Gongzui Hydropower Station 600 MW and Tongjiezi Hydropower Station 700 MW and the still under construction Dagangshan Hydropower Station 2600 MW. The main changes in the Hailuogou Glacier are the continued thinning of the ablation zone, not terminus retreat of the heavily debris covered terminus. The terminus is at 3000 meters (T), the debris cover dominates to 3400 m. The glacier continues with a low slope to the base of the icefall (I) at 3800 m. Through the icefall the elevation rises above the equilibrium line at 4900 meters (ELA). The thick debris cover insulates the underlying ice slowing the melting. Zhang et al(2010) indicate that thinning and retreat have both accelerated since 1989. The images from Google Earth below are from 2002. The glacier area has been reduced by 0.8 square kilometers over the last 44 years, but more importantly has thinned by 1.1 meters/year in the ablation zone (Pan et al, 2011). In the second image the red arrow indicates the start of the debris cover, and the blue arrow where the river emerges at the terminus. 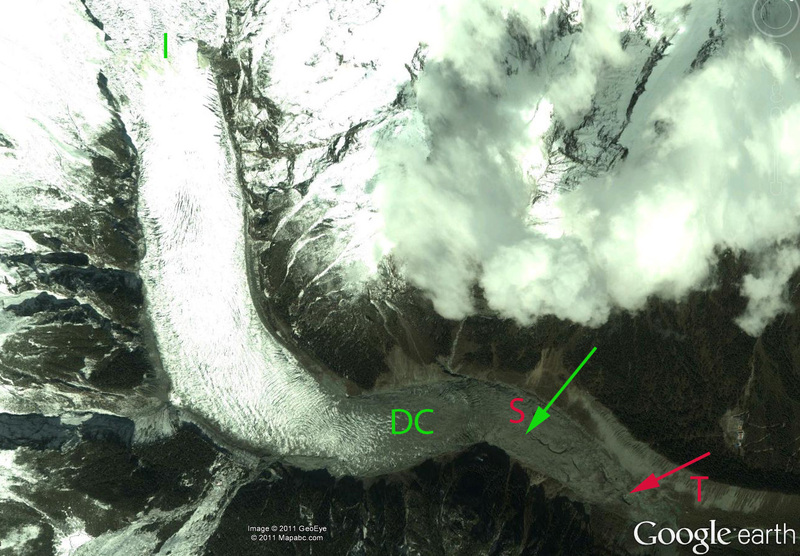 The beginning of the debris cover is noted (DC)(top image), the green arrow indicates where the glacier becomes stagnant and the debris cover is quite thick, the red arrow the terminus, where the glacial river emerges from below the glacier. 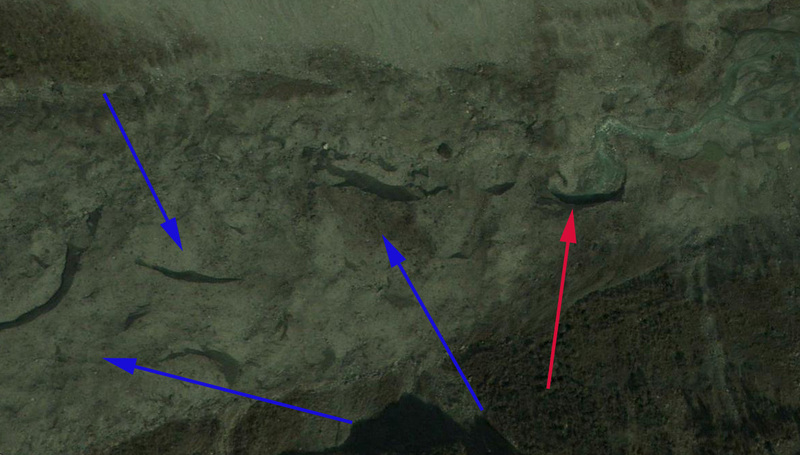 In the closeup the blue arrows indicate the thick debris covered glacier area and red arrow the terminus where the river emerges. . The retreat rate was 13 meters/year from 1966-1989 and 27 m/year from 1998-2008. They also report a significant reduction in glacier velocity in the ablation zone. This is an indication of increasing stagnation of the terminus area, that will lead to continued downwasting and retreat. 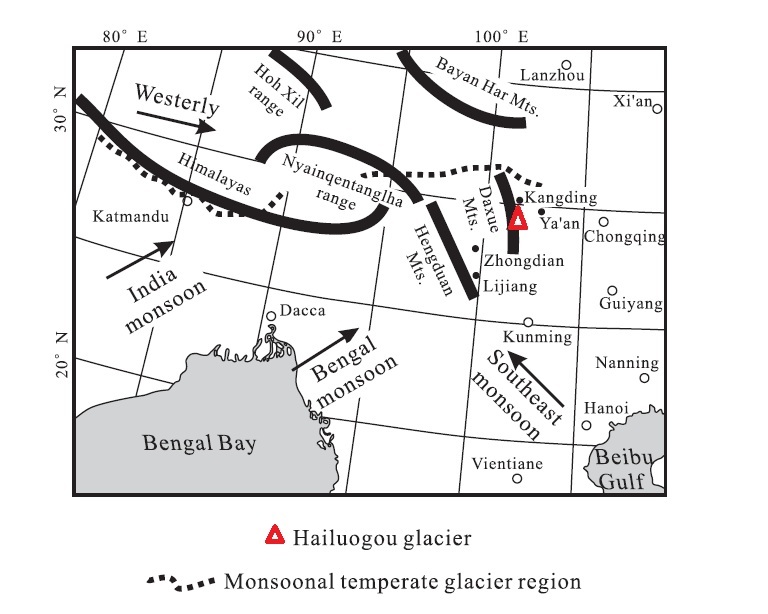 The glacier is responding to a temperature warming as noted at the Gongga Alpine Ecosystem Observation and Research Station of the Chinese Ecological Research Network, during 1966–2009, the mean annual temperature at the research station has been increasing by 0.15 to 0.21 C/decade. 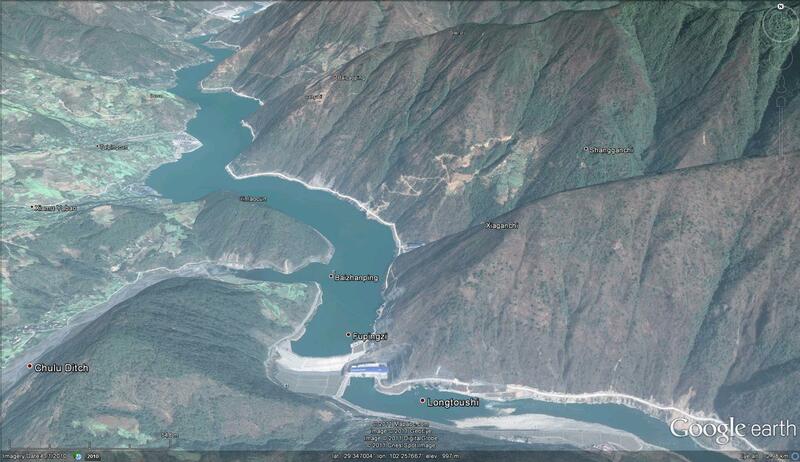 Two examples of the developing hydropower on the Dadu River fed by the glaciers of Gongga Shan are below with the Dagangshan Hydropower Station, 40 km downstream, top image and Pubugou Hydropower Station, 100 km downstream bottom image. 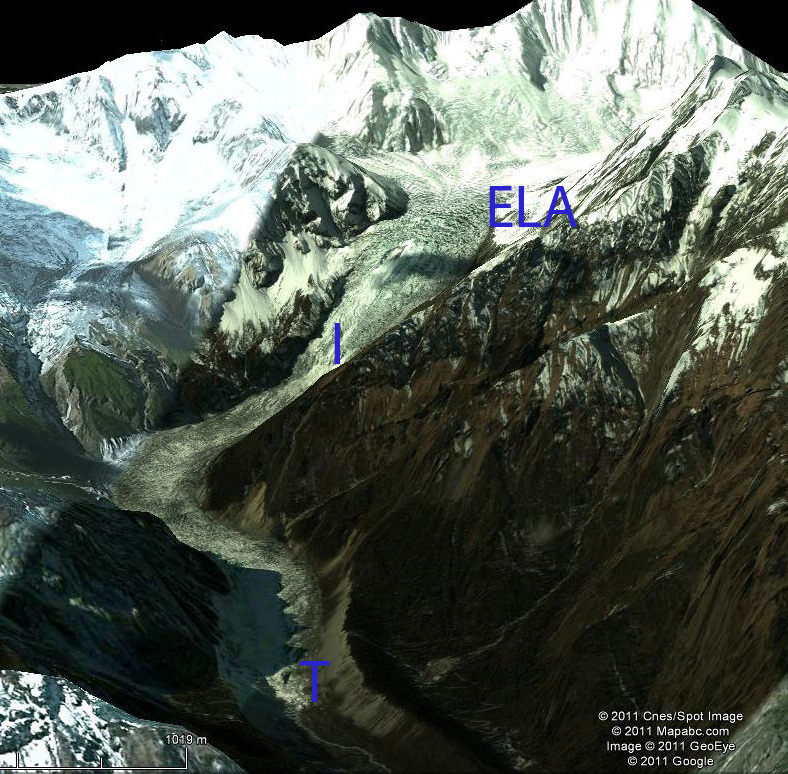 This entry was posted in Glacier Observations and tagged china glacier retreat, dadu river hydropower, Gongga Shan glacier retreat, Hailuogou Glacier retreat, Sichuan Glacier melt. Bookmark the permalink.